Boswellia papyrifera grows fairly extensively in Ethiopia, Eritrea, Kenya, and Sudan. It is a deciduous species that is taller than B. frereana and B. sacra, reaching 12 meters, with a clear bole. The species grows on steep escarpments in locations where other species find it difficult to survive. It thus helps protect hillsides by providing much needed soil cover and could perhaps be used in soil stabilization. The soft timber is suitable for plywood and matchwood and is used locally as small timber. The plant bears sweetly scented white to pink flowers and red capsular fruit. The bark is whitish to pale brown and flaking, similar to B. sacra and B. frereana. Like other Boswellia species that produce frankincense, the resin channels are located just below the inner bark. The tapping blaze is a square of 2.5 centimeters that is made only on the surface at a depth of 1 millimeter. The tree can be tapped 8–12 times during dry periods, and trees can yield resin for 50–60 years. 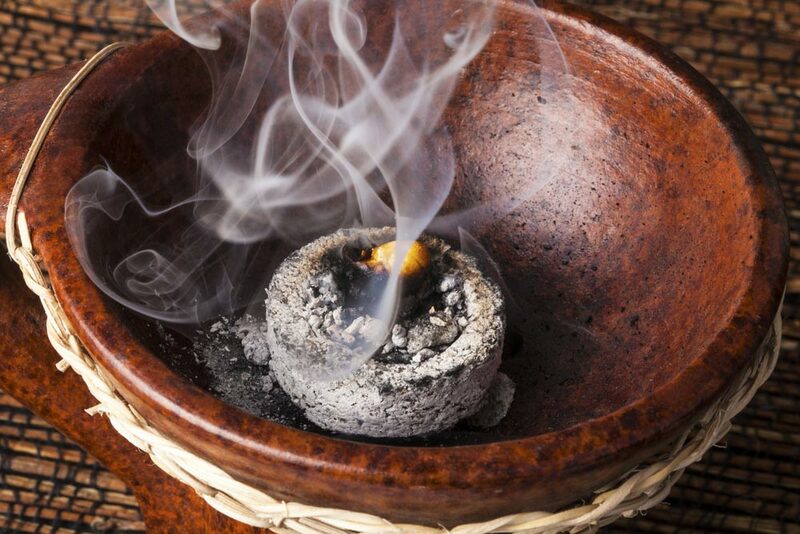 African Frankincense from Ethiopia is classified into five grades based on granule size, color, and purity. The first grade includes white granules that are 6 mm and larger in diameter and larger; the second includes 4–6 mm granules; the third includes 2–4 mm granules; the fourth includes brown and black granules of any size; and the fifth grade is powder mixed with bark. B.papyrifera frankincense has a fruity and citrus aroma with a predominantly soft orange flavor. B. papyrifera comprises 90 percent of exported frankincense; B. neglecta and B. rivae comprise the rest. Most frankincense produced from the region is exported to China for use in traditional medicine. The distilled oil is exported to Europe for use in incense in Orthodox and Roman Catholic ceremonies, though sandalwood is a popular alternative. B.papyrifera forms the bulk of the world supply of frankincense today, though overexploitation of the resin has led to its rapid depletion. Setting of seed and regeneration, which is already difficult given the preference of the species to inhabit steep escarpments, is further jeopardized by overgrazing and trampling by goats, sheep, and other fauna that hardens the forest floor. Additionally, inadequately trained harvesters damage the already threatened trees, indicating a lack of sound silvicultural practices for B. papyrifera. Studies by Rijkers et al. (2006) have revealed that tapping for frankincense leads to reduction in seeding and regeneration of B. papyrifera. Reduced saplings and seedlings on the forest floor are an early sign of degradation and decline of a crop. Although Tadesse et al. (2007) estimate that 1.5 million hectares of B. papyrifera remains available, it has been estimated that more than 170,000 hectares of B. papyrifera have been destroyed by fire over the last 20 years. Forest fires, either caused by humans or weather, are one reason for this decline. Fires occur in dry months when tapping is in full swing. The resin is inflammable. Ground fires tend to rapidly escalate into crown fires, which are more destructive to the ecology and cause rapid depletion of the site.